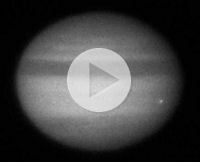 June 11, 2010: On June 3rd, 2010, something hit Jupiter. A comet or asteroid descended from the black of space, struck the planet's cloudtops, and disintegrated, producing a flash of light so bright it was visible in backyard telescopes on Earth. Soon, observers around the world were training their optics on the impact site, waiting to monitor the cindery cloud of debris which always seems to accompany a strike of this kind. "It's as if Jupiter just swallowed the thing whole," says Anthony Wesley of Australia, one of two amateur astronomers who recorded the initial flash. The other, Christopher Go of the Philippines, says "it was thrilling to see the impact, but the absence of any visible debris has got us scratching our heads." A color composite image of the June 3rd Jupiter impact flash. Credit: Anthony Wesley of Broken Hill, Australia. Indeed, it is a bit of a puzzle. "We've seen things hit Jupiter before," says planetary scientist Glenn Orton of JPL, "and the flash of impact has always been followed by some kind of debris." 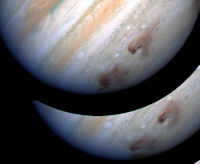 For instance, when fragments of Comet Shoemaker-Levy 9 hit Jupiter in 1994, each major flash observed by NASA's Galileo spacecraft produced a "bruise," a murky mixture of incinerated comet dust and chemically altered Jovian gas twisting and swirling among the native clouds. Just last year, in July 2009, Wesley discovered a similar mark thought to be debris from a rogue asteroid crashing into the planet. So where is the debris this time? A possibility offered by some observers is that the flash wasn't an impact at all. Maybe Go and Wesley witnessed a giant Jovian lightning bolt. of the impact recorded by Christopher Go of Cebu City, the Philippines. "I consider that very, very unlikely," says Orton. "NASA spacecraft have seen lightning on Jupiter many times before, but only on the planet's nightside. This dayside event would have to be unimaginably more powerful than any previous bolt we've seen. Even Jupiter doesn't produce lightning that big." Nor could it be a flash of lightning in Earth's atmosphere fortuitously happening in front of Jupiter. Simultaneous observations of the same flash from widely-spaced observatories in Australia and the Philippines rule that out. For the same reason, it couldn't be, say, a terrestrial meteor or any other phenomenon in the atmosphere of Earth. In short, the flash really happened at Jupiter. Curiously, the impactor (if indeed this was an impact event) struck right in the middle of Jupiter's South Equatorial Belt (SEB), one of the two broad stripes that girdle the planet. This is "curious" because the SEB itself vanished earlier this year. Orton has proposed that the missing belt still exists, it's just temporarily hidden underneath some high-altitude cirrus clouds. Could those very same clouds be hiding the impact debris? He doesn't think so. "The flash came from an altitude above any cirrus layer, so the debris should be plainly visible—if there is any." The best remaining hypothesis is that the impactor was small, packing just enough punch to make a flash, but without leaving much debris. One thing is sure: "Jupiter is getting hit more than we expected," says Don Yeomans, head of NASA's Near-Earth Object program of JPL. "Back in the days of Shoemaker-Levy 9 (SL-9), we calculated that we should see an impact on Jupiter once every hundred years or so. We considered ourselves extraordinarily lucky to witness the SL-9 event." "But look where we are now," he continues. "Anthony Wesley has observed two impacts within the past 12 months alone. It's time to revise our impact models [particularly for small impactors]." Clearly, researchers have a lot to learn, not only about how often Jupiter gets hit, but also what happens when the strikes occur. "We're continuing the search for debris at a number of major observatories, including Hubble," says Orton. Future observations sensitive to very small amounts of debris and to gases pulled up from Jupiter's deeper atmosphere may yet reveal what happened to the flashy impactor of June 3rd—or lead researchers in new directions entirely.